May 13, 2011 - The British Airline Pilots’ Association (BALPA) has issued a statement following the publication of a scientific study into cabin air quality by Cranfield University. This report describes the methodology and results of a study of aircraft cabin air quality undertaken by Cranfield University and two contracted analytical laboratories on behalf of the Department for Transport (DfT). ‘We welcome this long-awaited report and look forward to receiving the swab tests currently being undertaken by the Institute of Occupational Medicine in Edinburgh. In turn we will be studying the conclusions of the Committee on Toxicity who will be completing the overall research project and drawing together the threads,” said Jim McAuslan, BALPA General Secretary. "BALPA called for this research and has always maintained that the most rigorous scientific study is required and that industry must work in partnership on these matters. The Cranfield research is a major contribution to that end and we thank them for their work. We wish this approach underpinned other studies such as on pilot fatigue. Irrespective of the Committee on Toxicity’s conclusions there are examples of pilots who get ill and BALPA will continue to explore this as a matter of concern." This study was set up in light of concerns about possible adverse impacts on the health and well-being of air crew resulting from exposure to substances in cabin air. The principal objectives were to analyse cabin air for volatile organic compounds (VOCs), semi-volatile organic compounds (SVOCs), particles and carbon monoxide (CO) in normal operations during all phases of flight (e.g. climb, cruise, descent), and to detect and characterise any anomalous elevations of VOC, SVOC and particle concentrations during any „fume events or „air quality events where unusual smells or similar occurrences were reported. A total of 100 flights in 5 different aircraft types were monitored in this way. Monitoring of the total VOC (TVOC) concentration was carried out using a photo-ionisation detector (PID). Samples were also collected onto sorbent tubes using a portable pump for subsequent laboratory analysis by thermal desorption/gas chromatography/mass spectrometry (TD/GC/MS) to determine specific VOCs and SVOCs. The PID was additionally used as a real-time detector of possible fume events. Carbon monoxide concentration and ultrafine particle count were determined using a gas monitor (electrochemical sensor) and P-Trak ultrafine particle counter, respectively. The sampling strategy allowed for a series of samples to be taken at defined points on all flights, with additional provision for samples of any „fume events to be obtained immediately should they occur. These additional „air quality event samples were initiated by the researcher conducting the measurements whenever any change in air quality was detected by the PID or ultrafine instruments, or reported by anyone on the aircraft. The protocol was designed to yield samples of these events that were directly comparable to the routine samples taken. The first part of the study involved monitoring on Boeing 757 cargo aircraft and included all necessary preparatory work for these operations, including equipment purchase, questionnaire design and protocol development. Subsequently Parts 2 to 5 of the study utilised the equipment and methods of Part 1 to carry out monitoring on Boeing 757, Airbus A320/1, BAe 146 and Airbus A319 passenger aircraft respectively. Flight crew and cabin crew (if any) were requested to complete a post-flight questionnaire for all flights. This included questions concerning any fumes or smells that occurred during the flight. It was also completed by the scientist conducting the air quality measurements. The flight staff were informed that the questionnaire was to be used in addition to normal fume event reporting procedures and that it did not replace them. No fume event occurred during this study which triggered the airline's formal reporting procedures. Sorbent tube samples were analysed for the following target compounds: Tri-ortho cresyl phosphate (TOCP); one of a number of TCP isomers, Other tri-cresyl phosphate (TCP) isomers; applications include a minor component of engine oil, Tri-butyl phosphate (TBP); applications include a component of hydraulic fluid, Toluene, m+p- xylenes, Limonene, Tetrachloroethylene (TCE), Undecane. Mean values (and percentiles) for VOC/SVOC concentrations are presented for all data (all samples for all flights and all flight phases), for each flight, for each flight phase, and for each part of the study (aircraft type). For ultrafine particles, TVOCs and CO, the number of flights (flight sectors) with levels within specified ranges are presented. More detailed data are provided in Part 2 of this report. Mean ultrafine particle numbers (all flight sectors) were always in the range 1,000-100,000 particles cm-3. On five flight sectors peak concentrations exceeded the maximum range of the instrument (500,000 particles cm-3). Mean total VOC concentrations were mostly below 2 ppm and a number of the short duration peak concentrations above 10 ppm were probably due to exposure to isopropyl alcohol vapour generated by the p-Trak instrument. Maximum CO concentrations were mostly below 2 ppm. The most abundant VOC/SVOCs were generally limonene and toluene. Highest concentrations of TBP, limonene, m+p-xylene and undecane occurred during first engine start, while TCE concentrations were highest during the immediate sampling period. Highest levels of TOCP, other TCPs and toluene occurred during climb, pre-landing and take-off respectively. A total of 30 air quality event sorbent tube samples were collected during the study. Numbers of events were similar in Parts 1, 2, 3 and 5 of the study, and highest in Part 4. Events were largely concentrated at engine start and take-off, with few occurring at top of climb or during cruise. Concentrations of target analytes during these events were not elevated compared with the routine samples collected in each respective phase of flight. A total of 38 flights had fumes or smells reported by at least one crew member or researcher in a post flight questionnaire. The dominant smell descriptor was oil or oily, reported by 26 persons. Other descriptors were sweet, toilet smell, exhaust, chlorine, de-icing fluid, fuel, heated dust and human waste. Four persons reported that the fumes/smells caused a health effect (headache or slight headache in all cases). Some flights had up to 3 persons reporting a smell fume and others had only one person; a total of 60 (of 552) questionnaires reported a smell fume. Some flights had reports of smells in more than one phase, and in two instances the smell of human waste was reported throughout the flight. On other flights, fumes smells were reported during only one phase. The European standard ‘Aircraft internal air quality standards, criteria and determination methods (BS EN 4618: 2009) sets safety limits, health limits and comfort limits for a number of substances, including two that were measured in this study – carbon monoxide and toluene. The monitoring results indicate that concentrations of carbon monoxide did not exceed safety or health limits. Concentrations of carbon monoxide recorded during nine flights were equivalent to the 8h TWA (time weighted average) health limit, but this is believed to have been due to instrument malfunction rather than actual elevated levels of carbon monoxide. All measurements of toluene undertaken using sorbent tubes were well below the BS standard comfort limit of 153 mg m-3, the maximum concentration of toluene measured during flight being 0.17 mg m-3. In the absence of specific cabin air standards for the other pollutants measured in this study, reference is made to other standards and guidelines established, for example, for domestic (home) or occupational environments. Such standards/guidelines are available for TCE, TBP, TOCP, xylenes and limonene (as well as for toluene and CO). None of these standards/guidelines was exceeded. One short term (5 minute) concentration of limonene occurred (during Part 3 of the study) that exceeded a recommended long term exposure limit; however, this short duration peak would have a small impact on longer term average exposure. It is informative also to compare measured cabin air concentrations with levels typically seen in domestic indoor environments. Based on the reasonably extensive database for VOCs in indoor air in buildings, it can be concluded that the concentrations of toluene, limonene, xylenes, undecane and TCE in the aircraft cabin air are of similar magnitude to those occurring in homes in developed countries. Concentrations of CO generated by combustion sources, notably gas cookers, are often higher than those occurring in the aircraft cabins. For TBP and TCPs, there are few data to allow comparison of the measured levels in aircraft cabin air with the indoor air in buildings. There are more extensive data available on levels of organophosphates in household dust, including studies reporting levels of TBP, but these are of limited relevance to the present study. 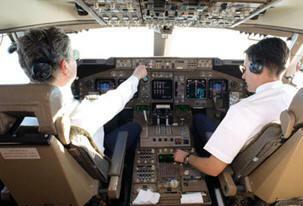 It is notable that in over 95% of the cabin air samples, no detectable amounts of TOCP or other TCPs were found. TBP was detected more routinely, but not in the majority of samples. The highest level of TBP recorded was 21.8 μg m-3 (overall mean 1.07 μg m-3) which exceeds any reported domestic indoor air level. TBP levels were highest during first engine start. Mean concentrations of most VOCs showed a trend, with minimum values occurring during the main phases of flight (climb to descent) and higher values when on the ground and during take-off. This trend was not found for limonene or the TOCP and other TCP measurements. Regarding the possible influence of aircraft type, no TCPs were detected during Part 3 (A320/1 aircraft), whereas limonene concentrations were relatively high on these flights. Other identified differences included highest concentrations of m+p-xylene occurring in Part 5 and lowest concentrations of toluene in Part 2. In conclusion, this study successfully completed a range of air quality measurements during the course of 100 flights. No fume events occurred during these flights that triggered the airline's protocols for formal reporting of incidents. Flight and cabin crew, as well as the investigating scientists reported a number of fume /smell events in a post-flight questionnaire. Samples specifically taken during recorded air quality events did not have notably elevated concentrations of any of the individually measured pollutants. Therefore, with respect to the conditions of flight that were experienced during this study, there was no evidence for target pollutants occurring in the cabin air at levels exceeding available health and safety standards and guidelines. To read full report.